This cozy home is perfect for a couples getaway. The living area is stylishly decorated. 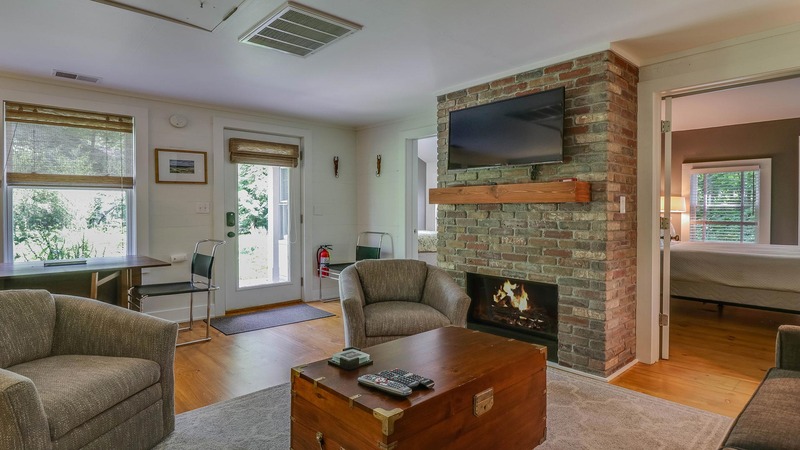 Have warm conversation or watch TV by the gas fireplace. The living area opens into the dining area. 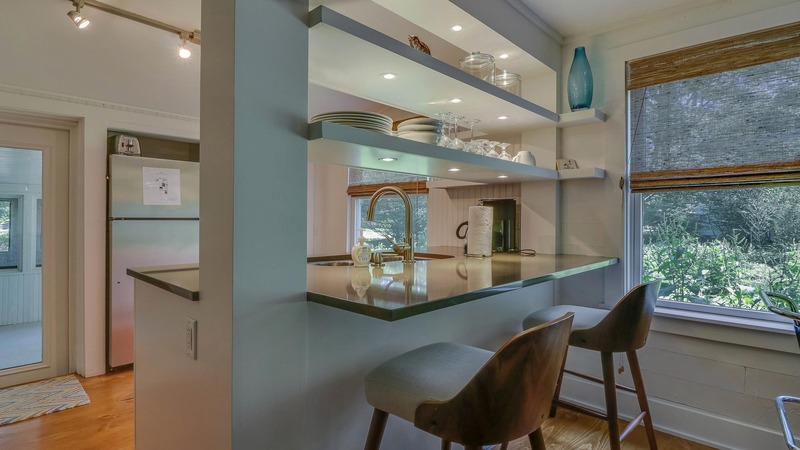 The kitchen has a breakfast bar with two stools. The dining area has seating for up to four. The modern kitchen overlooks the dining area. A view from the sink. 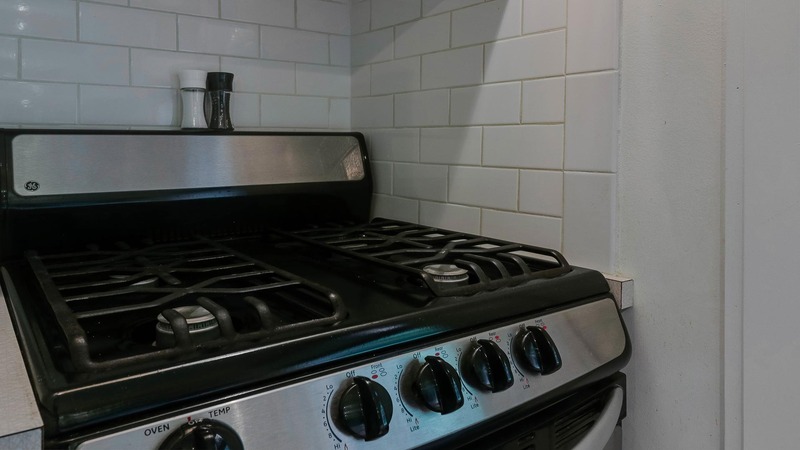 The kitchen has a gas-range stove. 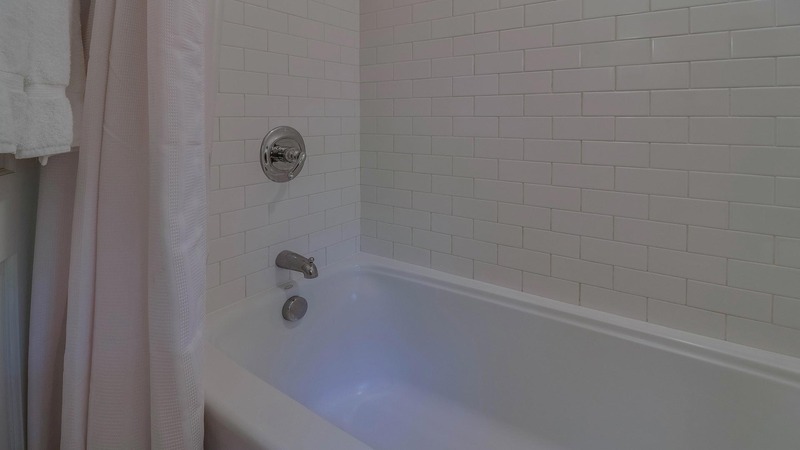 The bathroom features a shower and tub. 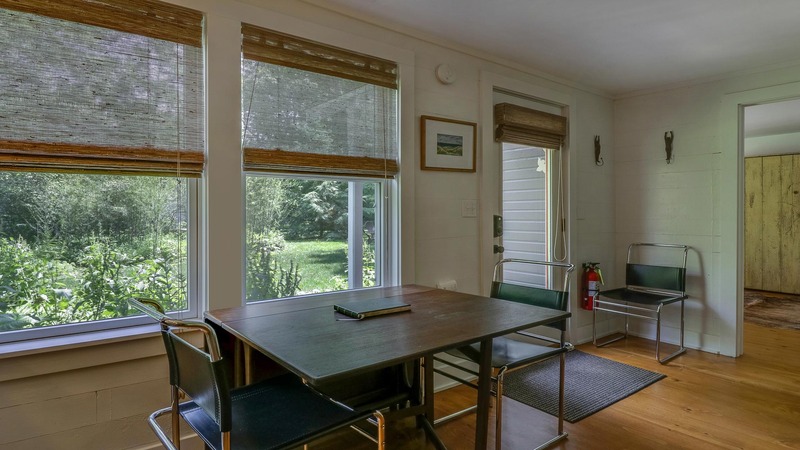 The bright screened-in porch is a great spot for conversation. Comfortable seating in the screened-in porch. This bedroom has a queen-size bed. Some storage and closet space is available in this bedroom. Another bedroom with a queen-size bed. The bed is flanked by windows, allowing for great morning light. Some more closet space in the bedroom. Gather around the firepit outside. 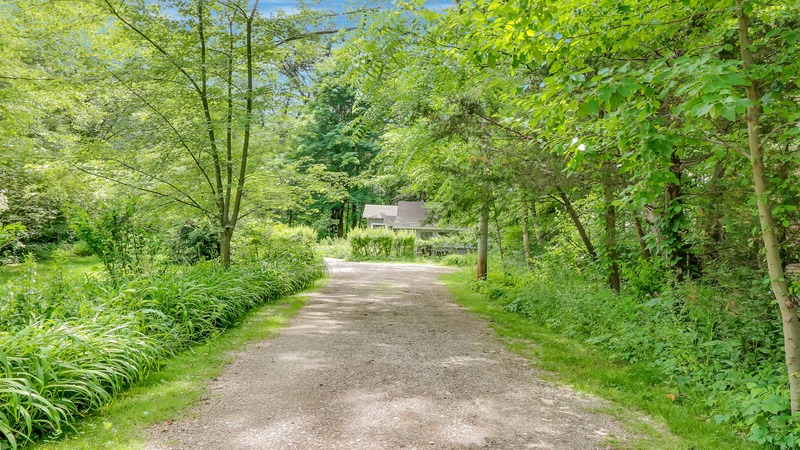 The driveway is surrounded by lush vegetation. 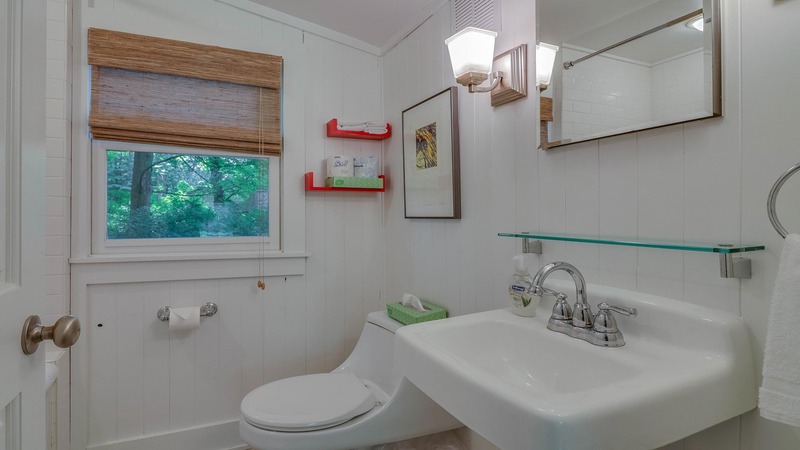 Settle into this quaint and cozy cottage located one mile from downtown Saugatuck. Surrounded by greenery and wooded on two sides, this vacation rental feels like a secluded cabin in the forest. It is a perfect escape with simple comforts to enjoy a step back in pace. 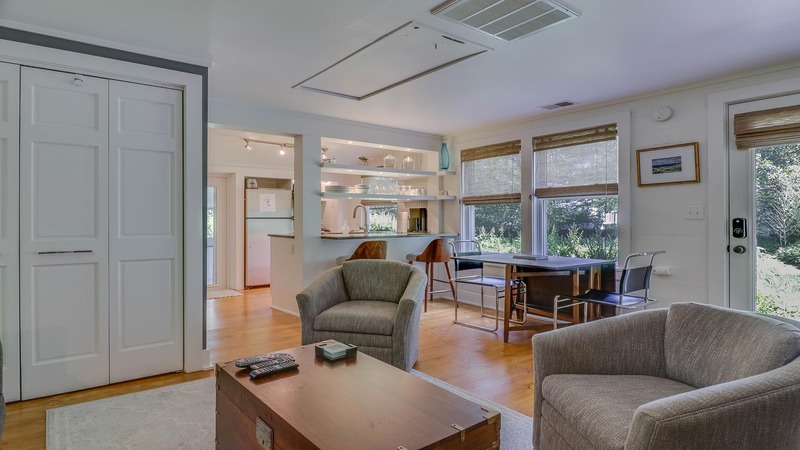 Everything about the inside of this home feels fresh, and you'll enjoy doing a bit of nesting yourself when deciding which room you like best. The living space is comfortable enough to curl up by the fireplace with a book or lounge on the couch and watch TV. Quiet mornings are best enjoyed on the screened-in porch, and make sure to call dibs on the slightly larger eastside bedroom for great morning light. The kitchen has everything you need, and there is a table with four chairs for eating or playing games. Outside, the grassy side yard is fit for a summer picnic, and the fire pit provides evening relaxation.